A family owned and operated business. My mother, me & our staff pride ourselves on providing knowledgeable, personalized service and a unique product offering at great prices. Our parent company has been supplying the Restaurant & Hotel industry with quality cooking and baking products since 1989. In 1996 we realized that many of our products were unavailable to the "home chef" and decided to open our little retail location in Pasadena. We soon outgrew that location and moved in September of 2001 to our current location in South Pasadena just a few steps away from the Thursday Farmer's Market. Many of our old friends have followed us and professional Chefs as well as "home chefs" continue to visit us in order to fulfill all of their gourmet needs. 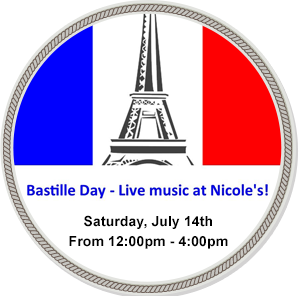 music of acclaimed accordionist Nick Ariondo!